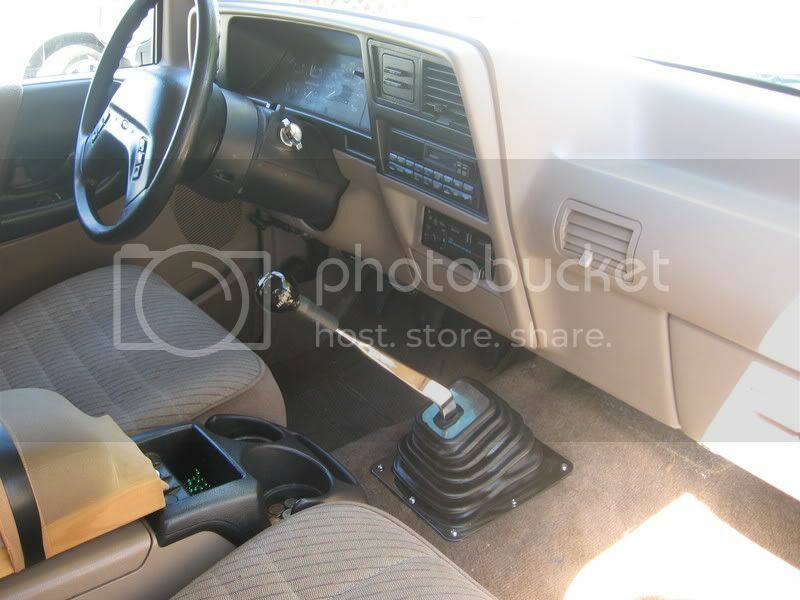 The shift extension needed for a manuel transmission when installing a body lift, what does it look like? I'd rather save a couple bucks and fab my own. yes. it looks like the two ends of both of them extended 3"
A buddy of mine was able to grind some of the plate out of the way so the truck would be functional. It's not the floorboards he grinded. Theres a metal plate with a hole thats attached to the floorboard. He grinded enough metal away so it would shift into every gear. You shifter will still be 3" lower but it can buy you some time. You shifter will still be 3" lower but it can buy you some time. quick shift for sure who needs a hurst! for my hurst i just tig-welded together 4 - 3/8 nuts and used a cut-off peice of a 3/8 bolt and lock-tite it into the extention. gave me a 2" extention overall. had a shift **** off a old internationel harvester grain truck, but went back to the stock hurst ****. rascan, can you post a pic of your hurst extension. Or maybe elaborate a little more. I am fabbing one right now. So far I cut two 5" pieces of 1/2" steel as wide as the shifter and drilled four holes into them. I sandwiched them on the lower peice and bolted the shifter inbetween. I havent installed it yet. I need to buy some different bolts tomorrow. Since I dont know how to post a pic I hope that giives some idea of what I have done. you can do it without welding. I did one not too long ago. They have those nuts that are about 2" long that are used to connect two pieces of all thread together. Use that (which looks clean) and then get a 2"-3" long piece of all thread. (lowes had the the short all thread in the the drawers in the bolt aisle). 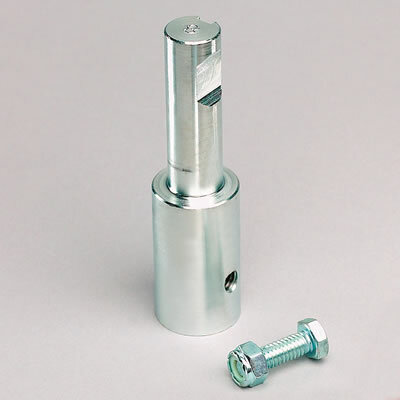 Screw the nut to the shifter, put the all thread into the nut, and screw the ball onto the all thread. Ok, I went ahead a bought one. Next question, do I HAVE to have it? Here's my dilemma, I cleared my saturday(the 21st) to install the lift, but the shift extension might not come for a couple days afterwards. Can I get away without it for a few days. I've been waiting to install this thing for awhile now. just leave the center console off for a few days. ypu might havea problem getting it into 2nd 4th and reverse though still. when i did the bl on my 02 ranger i didnt have the shift extension at the time either and when i finished the bl install i coukdn't put my truck in 2nd, 4th, or reverse so the hole that the shifter sticks through in the cab, i had to take a grinder to it and make it bigger. After i had to do that i ment ahead and ordered the shift extension becuase i couldn't put the center cupholder console around the shifter back in and drove my truck for a week like that and had the hear all the road noise. It was annoying. So I'd try to put the extension in at the time of the bl install if possible. and i was the one Wayne was talking about that took an air powered die grinder to the floor "board" lol, the sheet metal, i just had to grind a notch in the floor so it would get in and stay in second. i would have gotten a 2" connector like what was mentioned, but had the nuts and welder acces at work so i figured what the heck, have a peice of 5/8 heater hose slid over the extention, meeting up with the base of the shift ****. http://i98.photobucket.com/albums/l2...rdtruck002.jpg <--click here for picture. I love the look of the cupholders removed. mine never had cupholders at the base of the shift boot, just at the front of the center console. i kept all my original parts so if (when) i ever get a newer ranger i can keep my hurst.